Heavenly Outlook is a beautiful, newly-built luxury cabin located in a gated community in Blairsville, GA.
Heavenly Outlook is a beautiful, newly-built luxury cabin located in a gated community in Blairsville, GA. The mountain views are phenomenal and can be enjoyed from your choice of any of the 3 levels of deck the home offers. Enjoy beautiful mountain views while you are cooking, sitting by the gas log fireplace or eating a meal from the open floor plan main level of this home. The massive dining table seats 12 with a chandelier that is an impressive handcrafted canoe built by the owner. The expansive kitchen bar seats an additional 8. The chef’s kitchen has a 5-burner gas stove top, a wall oven, microwave, large refrigerator and every gadget in a chef’s dream. The living area has a 13-ft sofa and two recliners to accommodate a large family. And of course, above the fireplace is a flat screen TV for family movie night. Also on the main level is a King Bedroom with an en-suite shower/tub combo that has its own access to the deck. An additional ½ bath with a stacked washer and dryer are also located on the main level. The deck outside the main level of the home offers outdoor seating/dining/ gas grilling and a wood burning fireplace. The second level of the home is the Master (King) Bedroom with an en-suite and its own private deck. The master bath has an air-jet tub, a 2-person shower, double sinks and a private water closet. The basement of the home has a third King Bedroom with en-suite tub/shower combo and 2 Bunk Rooms with Queen Bunk Beds. There is a fourth full bath with tub/shower combo for the basement. Also located in the basement is a pool table, wet bar, TV viewing area, gas log fireplace and access to another large deck where you will find a gas log fireplace, patio furniture and a Jacuzzi Hot Tub. 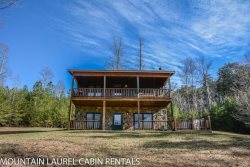 Come stay with us and discover the many things to do in the North Georgia Mountains. All of our cabins include linens, dishes, pots, pans, towels, wash clothes, etc... We will provide an initial supply of guest soaps, toilet paper, dishwasher detergent, paper towels and trash bags. For an extended stay we suggest you bring a supply of toilet paper, paper towels and laundry detergent. This Cabin has a 5 Night Minimum Stay. Our three families truly enjoyed the cabin. There was everything we could want and we had a great time! Heavenly outlook was perfect for the 12 of us!! The cabin is beautiful, comfortable, well equipped. We really enjoyed our stay. My Family had a great time. The cabin is wonderful. We had family from the ages of 7 to 90. Everyone had a wonderful time. As always everyone in the office was very helpful. See you again soon!!! Thank you so much for the beautiful upgrade.This cabin was absolutely the best. Everything was top of the line. There was not a speck of dust anywhere. The windows were sparkling clean so we could enjoy the beautiful view . We loved the fact there was so many things in the house with Bible verses that made us feel like we were truly close to Helen.The gated community, the peaceful quiet, the private dock and swimming pool was amazing. To the owners I cannot think of one thing you need to improve on.Thank you for sharing your beautiful home. The process was simple and mostly done on-line. The one time I had to call, the female I spoke with was helpful and kind.